Library Wars is one of the most enjoyable films I’ve watched this year. It uniquely blends political espionage, warfare and romantic comedy into a touching and entertaining film. Library Wars instantly sets up a believable world and completely fleshes it out. Set in a not-too-distant-future dystopian Japan, the government has passed new laws in order to censor any books it deems “immoral”. Agents of the Betterment Act are charged with tracking down and destroying all questionable material. In response to this, the Library Defence Force was formed to protect creativity and free expression. Iku Kasahara (Nana Eikura) is a young woman who desperately wants to join the Library Defence Force, after a chance encounter in a bookstore inspires her to help protect books. Once accepted into the Force, her determination tests the patience of her supervisors and friends alike. All the while, tensions are mounting as the Betterment Act agents start using non-sanctioned power in order to cover up the government’s past sins. 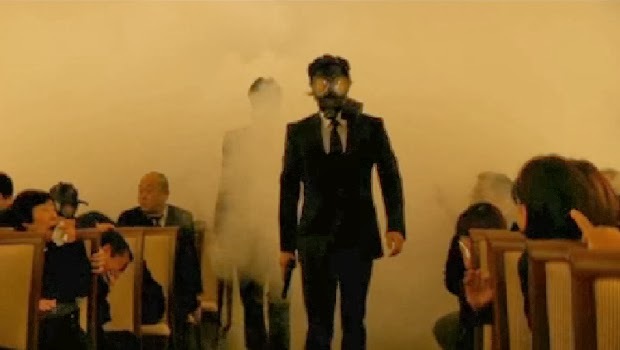 Director Shinsuke Sato manages to meld several genres which usually shouldn’t work together. Who would have thought that a romantic comedy, political drama and war film would blend together so seamlessly? Thanks to cinematographer Taro Kawazu, the films looks drop-dead gorgeous, especially inside the Library Defence Force’s home base. The film has a futuristic look which suits the story but somehow it still feels grounded in reality. The action set pieces, whilst fairly straightforward, are very effective. I’ll definitely track down more films from Mr Sato. The soundtrack was handled by composer Yu Takami. This reminded me of a Hans Zimmer or Danny Elfman score, one which shifted so easily with the narrative and perfectly punctuated the scenes. I felt myself surging with the action sequences and being lulled in by the more emotional sequences thanks in the most part to the music. The performances are fantastic, in particular Nana Eikura who reminds me of Cameron Diaz in that she conveys so much charm and natural comedy. Junichi Okada plays the gruff, seen-it-all-before supervisor of Kasahara. The on screen chemistry between Okada and Eikura is partially why I enjoyed this so much. They are ably supported commendably by Chiaki Kuriyama (Kill Bill 1), Koji Ishizaka and Jun Hashimoto. The performances really sold the moments of tension as well as the comedic scenes. I’ll be honest; it got a little dusty for me at times during some of the more touching scenes. This is a must see film, it’s that simple. I adored it from the opening to closing shot. It’s everything I ever wanted or needed from a big blockbuster. This is proof yet again of how far American blockbusters have devolved to the rest of the world in terms of originality. This is a massive scale yet heartfelt film which isn’t afraid to tackle big ideas. Easily top-ten-of-the-year material. 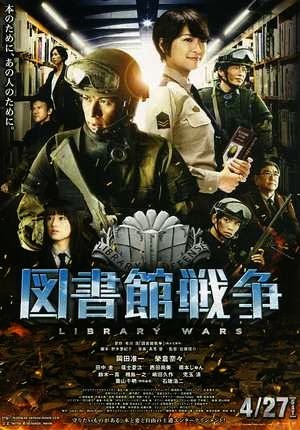 Library Wars is screening as part of the Japan Foundation Sydney's Japanese Film Festival 2013. If you see the film and agree or disagree with my thoughts feel free to leave a comment below.